(əpŏl`ō), in Greek religion and mythology, one of the most important Olympian gods, concerned especially with prophecy, medicine, music and poetry, archery, and various bucolic arts, particularly the care of flocks and herds. He was also frequently associated with the higher developments of civilization, such as law, philosophy, and the arts. As patron of music and poetry he was often connected with the Muses. Apollo may have been first worshiped by primitive shepherds as a god of pastures and flocks, but it was as a god of light, Phoebus or Phoebus Apollo, that he was most widely known. After the 5th cent. B.C. he was frequently identified with Helios, the sun god. 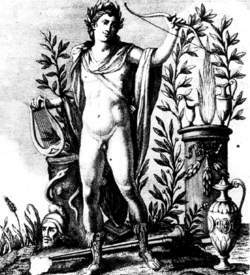 Apollo was the father of Aristaeus, Asclepius, and, in some legends, Orpheus, although his amorous affairs were not particularly successful. Daphne turned into a laurel rather than submit to him, and Marpessa refused him in favor of a mortal. He gave Cassandra the gift of prophecy, and when she disappointed him, he decreed that no one would believe her prophecies. His chief oracular shrine was at Delphi, which he was said to have seized, while still an infant, by killing its guardian, the serpent Python. This event was celebrated every eight years in the festival of the Stepteria. Other festivals held in Apollo's honor included the yearly Thargelia, to celebrate spring, and the Pythia, held every four years to honor his victory over the Python. Besides Delphi, his other notable shrines were at Branchidae, Claros, Patara, and on the island of Delos, where, it was said, he and his twin sister, Artemis, were born to Leto and Zeus. In Roman religion, Apollo was worshiped in various forms, most significantly as a god of healing and of prophecy. In art he was portrayed as the perfection of youth and beauty. The most celebrated statue of him is the Apollo Belvedere, a marble statue in the Belvedere of the Vatican. (ă-pol -oh) The American space program for landing astronauts on the Moon and returning them safely to Earth. A manned lunar landing, to be achieved before 1970, was proposed to Congress in 1961 by President J.F. Kennedy following the first manned flight by what was then the USSR. Prior to Apollo 7, the missions were designed to test the Saturn 1B and Saturn V launch vehicles, the command and service module (CSM), and the lunar module (LM). After three astronauts were killed in a flash fire inside the command module (CM) during ground tests in Jan. 1967, the program was delayed for 18 months while the CM was redesigned. NASA commemorated the three astronauts by redesignating the mission that they would have flown in as Apollo 1. The subsequent Apollos 2–6 were crewless test flights. The method selected for the flight program was lunar orbit rendezvous. The astronauts were to travel to and from the Moon in the command module, which contained the controls and instruments. Rocket engines and fuel supplies were housed in a separate service module (SM). On entering lunar orbit the command-module pilot would remain in the CM while the commander and lunar-module pilot made the landing in the LM. On completion of the mission on the Moon's surface, the descent stage was to remain on the Moon: the ascent stage of the LM was to carry the astronauts into lunar orbit and rendezvous with the command and service modules. The craft would then embark on its return journey, the LM being jettisoned. The SM was to be jettisoned just prior to reentering the Earth's atmosphere. 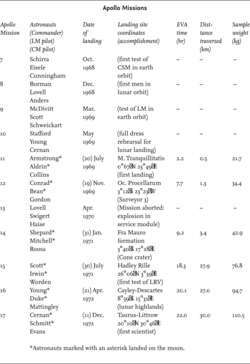 Details of the Apollo flights are given in the table. Apollo 7 was the first piloted test flight of the CSM. Apollo 8 was the first to be launched by Saturn V and to enter lunar orbit. The LM was tested in Earth orbit by Apollo 9, in lunar orbit by Apollo 10, and landed on the Moon for the first time by Apollo 11 on July 20 1969. Apollo 11's landing site, in Mare Tranquillitatis, was dubbed ‘Tranquility Base’. Apollo 12 landed with higher accuracy than its predecessor, touching down in Oceanus Procellarum close to Surveyor 3, parts of which were returned to Earth. Both missions returned basalts from the maria. Apollo 13 was aborted safely after an explosion in the service module and its target was taken over by Apollo 14. This was to collect rocks from Cone crater (25 million years old) in the Fra Mauro formation. Mobility was increased by the use of a Modular Equipment Transporter but the terrain was unexpectedly rugged. Complex non-mare basalt breccias were returned. The last three Apollos visited sites with multiple objectives, collected deep (two meter) drill cores (in addition to wide cores, soils, pebbles, and larger rocks), and used a Lunar Roving Vehicle. Apollo 15 returned samples of anorthosite and green glass from the Apennine mountains and mare basalts from Hadley Rille. Apollo 16 landed in the vicinity of South Ray and North Ray craters (2 and 50 million years old respectively) in the highlands to sample the Cayley and Descartes formations, but returned only anorthositic breccias rather than volcanic rocks. Apollo 17 included a scientist-astronaut for the first time. It landed in a dark and light mantled mare-filled valley between high massifs on the borders of Mare Serenitatis. Several boulders were sampled and unusual orange glass was found near a 30-million-year-old dark halo crater, called Shorty. Experiments performed on the Moon by Apollo included solar-wind, lunar-atmosphere, cosmic-ray and neutron detection, heat-flow and magnetic-field measurements, active and passive seismometry, and laser ranging. Apollos 15, 16, and 17 were equipped with experiments in the service module, including metric and panoramic photography, laser altimetry, radar sounding, magnetometry, and gamma-ray, ultraviolet, and alpha-particle spectrometry. Subsatellites were ejected from the SM for particle and field measurements. Spent boosters were crashed as seismic sources. After Apollo 17, the remaining hardware of the program was used in Skylab and the Apollo-Soyuz test project. See also Gemini project; Lunar Orbiter probes; Luna probes; Mercury project; Moon rocks; Ranger; Zond probes. The god Apollo shown in his role at Delphi, a settlement established during the Mycenaean period where the Temple of Apollo was constructed. Reproduced by permission of Fortean Picture Library. Apollo, asteroid 1,862 (the 1,862nd asteroid to be discovered, on April 24, 1932) is approximately 1.4 kilometers in diameter and has an orbital period of 1.8 years. Apollo was named after the Greek sun god, patron of the fine arts, medicine, music, poetry, and eloquence. According to Martha Lang-Wescott, Apollo indicates where recurrent learning experiences occur—where people are slow to learn to change our patterns. Lang-Wescott, Martha. Mechanics of the Future: Asteroids. Rev. ed. Conway, MA: Treehouse Mountain, 1991.
the name of American spacecraft used for the astronauts’ flights to the moon and also the name of the program for its development and of the flights. The Apollos are launched by Saturn 5 rockets, which were first used in late 1967 and early 1968. The Apollo consists of two stacked space vehicles (modules) which are placed into an earth orbit by the launch vehicle and then make a joint flight to the moon where they pass into a lunar orbit. One of the vehicles—the orbiter—houses the three astronauts, two of whom descend in the second vehicle—the lander—to the moon, then lift off from the moon into an artificial lunar satellite orbit and subsequently dock with the orbiter in which the whole crew returns to the earth. The total weight of the Apollo, including the engines and fuel supply, is about 44 metric tons. The orbiter, which is also called the principal unit, consists of the command module—the conical earth-landing apparatus having a weight of approximately 5.6 metric tons, a base diameter of 3.84 m, and a height of 3.4 m that houses the astronauts during the entire flight—and the service module weighing 22.8 metric tons, including 17.6 metric tons of fuel. The landing vehicle—the lunar module—has a weight of 14.5 metric tons and a height of 7 m. It consists of the descent stage equipped with landing gear and the ascent stage containing the pressurized astronauts’ compartment. Major flights during 1967–70. The unmanned Apollo 4 was launched into an earth orbit by a Saturn 5 rocket on Nov. 9, 1967, and carried out an entry check of the descent apparatus into the atmosphere with a velocity of 11 km/sec (at the cost of a boost from its rocket engine). The unmanned Apollo 5 carrying a lunar module was launched on Jan. 22, 1968, into an earth orbit by a Saturn 1B rocket. The unmanned Apollo 6 was placed in an earth orbit by a Saturn 5 launch vehicle on Apr. 4, 1968. Apollo 7, with the spacecraft’s command module carrying the astronauts W. Schirra, D. Eisele, and W. Cunningham, was placed in an earth orbit by a Saturn 1B rocket on Oct. 11, 1968. The flight lasted 10.7 days (163 orbits) with splashdown in the Atlantic Ocean. Apollo 8, carrying the astronauts F. Borman, J. Lovell, and W. Anders, was injected into a translunar trajectory on Dec. 21, 1968, by a Saturn 5 rocket. On December 24, the spacecraft shifted into an artificial satellite orbit around the moon (height of the perilune, 112 km; of the apolune, 312 km; and after correction a circular orbit at a height of 113 km). Completing ten revolutions around the moon, Apollo 8 then started back to earth and splashed down in the Pacific Ocean on Dec. 27, 1968. Apollo 9, carrying astronauts J. McDivitt, D. Scott, and R. Schweickert, was launched into an earth orbit on Mar. 3, 1969, making a ten-day flight. Apollo 10—with astronauts T. Stafford, J. Young, and E. Cernan—launched on May 18, 1969, by a Saturn 5 rocket, again orbited the moon, going into a circular lunar orbit on May 21. Astronauts Stafford and Cernan transferred to the lunar module, detached from the principal unit of Apollo 10, and descended to within 15 km of the moon’s surface. The orbit was then changed (height of the perilune, 23 km, and of the apolune, 380 km). The flight in the lunar module lasted about eight hours. After detaching the descent stage, the astronauts in the ascent stage approached the command module and docked with it. The spacecraft spent a total of 61 hours and 40 minutes in a circular lunar orbit and completed 31 revolutions. The spacecraft splashed down in the Pacific Ocean on May 26 after eight days of flight. Apollo 11, carrying N. Armstrong (spacecraft commander), M. Collins (pilot of the command module Columbia), and E. Aldrin (pilot of the lunar module Eagle), made a historic flight with a lunar landing and return to earth. The Apollo 11 was launched by a Saturn 5 rocket on July 16, 1969, from a launch pad at the Kennedy Space Center. After 76 hours, Apollo 11 went into an initial circular lunar orbit with a perilu-nar height of 112 km and an apolunar height of 314 km. As a result of maneuvers and the influence of anomalies in the lunar gravitational field, the orbit became circular with a height of 111 km. Armstrong and Aldrin transferred to the lunar module and undocked from the command module. The lunar module, piloted by Armstrong, made a successful lunar landing on July 20 at a point on the equator, illuminated by the sun, in the southwest part of the Sea of Tranquility at the edge of a crater (0°41’15” north latitude and 23.26° east longitude). On July 21, Neil Armstrong became the first man to step on the moon’s surface; he was joined 20 minutes later by Edwin Aldrin. The astronauts, dressed in spacesuits with self-contained life-support systems, moved over the lunar surface within 30 m of the Eagle. They set up a television camera, a seismometer, and a laser-radar reflector for measuring the distance between the earth and the moon with high accuracy; unwound a roll of aluminum foil to trap particles of inert gases in the solar wind; gathered 22 kg of lunar rock specimens; took photographs; spoke over the telephone with earth; planted the flag of the United States; and left five medals with pictures of the astronauts who had perished: Iu. A. Gagarin, V. M. Komarov, V. Grissom, E. White, and R. Chaffee. Television transmission was maintained with the earth during the entire period the astronauts were on the moon. The landing site was named Tranquility Base. Aldrin returned to the module after one hour and 44 minutes and Armstrong followed him ten minutes later. On July 21, the astronauts lifted off the moon, having spent 21 hours and 36 minutes on it. By carrying out a series of maneuvers in circular lunar orbits, they docked with the Columbia, transferred into it, detached the lunar module, and, after firing the propulsion engine, went into a transearth trajectory. On July 24, Apollo 11 successfully splashed down in the Pacific Ocean near Johnston Island southwest of the Hawaiian Islands. A helicopter carried the astronauts in biological isolation garments to the aircraft carrier Hornet where they were transferred to the airtight quarantine trailer. The astronauts were conveyed by airplane to the Mission Control Center in Houston, where they were transferred to isolation quarters, remaining there until August 12. No symptoms of infection were noted. A careful examination of the lunar rocks brought back to earth by the crew revealed no traces of life. Apollo 12, with astronauts C. Conrad (spacecraft commander), R. Gordon (pilot of the command module Yankee Clipper), and A. Bean (pilot of the lunar module Intrepid), made another flight to the moon, lifting off on Nov. 14, 1969. The spacecraft went into an initial circular lunar orbit on November 18. During the final part of the landing under manual control, the craft flew over a crater approximately 200 m in diameter where the unmanned lunar station Surveyor 3 had been located since April 1967. On November 19, Conrad landed the lunar module on a level surface approximately 180 m from the station. Conrad emerged from the module onto the lunar surface at 14 hours and 44 minutes and Bean at 15 hours and 15 minutes. On the moon the astronauts set up an antenna, an aluminum trap for the atoms of inert gases present in the solar wind, radio isotope power equipment with an output of 63 watts, and a set of instruments for transmitting telemetered data to the earth. They took photographs and motion pictures and gathered soil specimens from the surface and at depths of up to 0.3 m. The lunar surface turned out to be dustier than at Apollo 11’s landing site. Bean returned to the lunar compartment at 18 hours and 16 minutes and Conrad at 18 hours and 27 minutes. On November 20, at 7 hours and 01 minute, Conrad again went out on the lunar surface, followed ten minutes later by Bean. The astronauts gathered lunar soil specimens, investigated six small craters, descended into the crater to the Surveyor 3, and removed some of its components for examination in laboratories on the earth. At 10 hours and 44 minutes, the astronauts returned to the lunar module. During the first excursion, the astronauts covered a total of 1.5 km and on the second, 1.8 km. They gathered approximately 45 kg of lunar soil specimens. The ascent stage of the lunar module lifted off at 17 hours and 26 minutes and after a series of maneuvers docked with the command module. An extensive program of photographing the lunar surface was carried out from a circular lunar orbit. In the 45th orbit the engine was fired and the spacecraft transferred to a transearth trajectory. Television sessions were conducted during the flight to the moon and back. Apollo 12 splashed down in the Pacific Ocean on November 24. Apollo 13, with astronauts J. Lovell, J. Swigert, and F. Haise, which took off on Apr. 11,1970, was unable to land on the moon because of an explosion in the service module which endangered the crew. After orbiting the moon, Apollo 13 splashed down in the Pacific Ocean on April 17. To the Greeks, the planet Mercury when it was a morning star. An asteroid with a very eccentric orbit and perihelion inside the orbit of Venus that passed about 1.8 × 106 miles (3 × 106 kilometers) from earth in 1932. (1) The code name for Windows Phone 8. See Windows Phone. (2) The code name for Adobe's cross-platform development system. See Adobe AIR. (3) An earlier manufacturer of high-performance workstations, founded in 1980. Pioneering the concept of tying workstations together across a network, Apollo became a division of HP in 1989. Whether you're taking a shower or a steam bath, soaking in a tub, or just getting a tub massage, Appollo can provide the best choice at the best price. With 30 years experience in gas servicing and central heating installation, Appollo Gas Services prodes itself on an experienced and skillful workforce. The Turnocks bred their original wild cat, Appollo, with a female Bengal cat. Ms Bromley is now trying to contact sailors who served on Shirley's ship, HMS Appollo, at the time in case they unknowingly hold further proof of his innocence. For further information, contact John robotham at Appollo Computer, Chelmsford, Mass. As a part of the launch, Baden Supply also announced that it is introducing it's own signature Baden Bath product line along with the Appollo brand of bath products, a top manufacturer of showers and whirlpool tubs sold across Europe. Whether it's taking a shower or a steam bath, soaking in a tub or getting a tub massage, Appollo can provide the best choice at the best price. Appollo Gas Services Ltd has been installing and repairing gas appliances for over 29 years. But Barron had to settle for second in the 6f handicap with Imperial Sword, who found Appollo Shark, ridden by Robert Winston for Howard Johnson, just too strong. Connolly's amazing outburst came after he stunned fans at the Hammersmith Appollo in West London by joking about the threat to behead Iraqi kidnap victim Mr Bigley. However, with Kevin Yates and Waterloo old boy Stuart Turner proving highly effective props, towering Scot Iain Fullerton in the second row, and a refreshed Appollo Perelini, Alex Sanderson and Peter Anglesed at the back, the pack has so far managed to hold its own. We've already seen Birmingham's Wyko, Lilleshall and Appollo Metals make the move and are likely to see Elbief, Dowding & Mills, Warwickshire's Britax International and Gloucester-based Infast all do the same before the year is out.